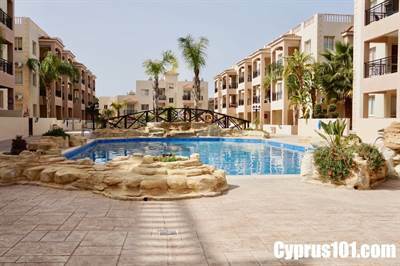 This immaculately presented 2 bedroom, 1 bathroom ground floor apartment is situated on a luxury gated complex in the popular touristic area of Kato Paphos. The coastal path and many amenities of Tomb of the Kings are a short stroll away including restaurants, bars, shops and local bus service. The communal facilities are maintained to an exceptional standard and include two crystal clear swimming pools with surrounding sunbathing terraces nicely separated by a decorative arched bridge. Each has a fabulous raised corner jacuzzi edged with stone and a children’s paddling pool, toilet/shower facilities and luscious landscaped gardens complete the impressive facilities.